Katie Smith finished the day shooting 7-for-13 from the field, including two threes. The Knights jumped out to an early 12-2 lead as senior Kayla Cleare scored six early points and Smith and Annie Keenan each knocked down a triple. Following a Lauren Quesada layup to cut the lead to seven, the Knights responded with a 9-0 run to end the quarter following another Keenan triple just before the buzzer. The Mount scored the first 13 points of the second quarter to put together a 22-0 run as they took a 36-7 lead with just over five minutes remaining in the quarter. Cleare knocked down another six quick points and Lyndsay Pace had four during the run. The Knights took a commanding 40-15 lead heading into the halftime intermission. Mount Saint Mary shot 45.7-percent in the first half and knocked down four triples. The Mount ripped down 10 offensive rebounds and held St. Joseph’s-Brooklyn to 22.6-percent shooting and only one three-point field goals. Cleare finished the first half with 12 points and six boards and Keenan added nine points and five rebounds. The Knights finished the third quarter on a 12-1 run as they pushed the lead to 33. Smith knocked in six points in the quarter and Pace knocked down two threes in the third period. Smith scored her final seven points of the night early in the fourth quarter as the Knights pushed the lead to 37. 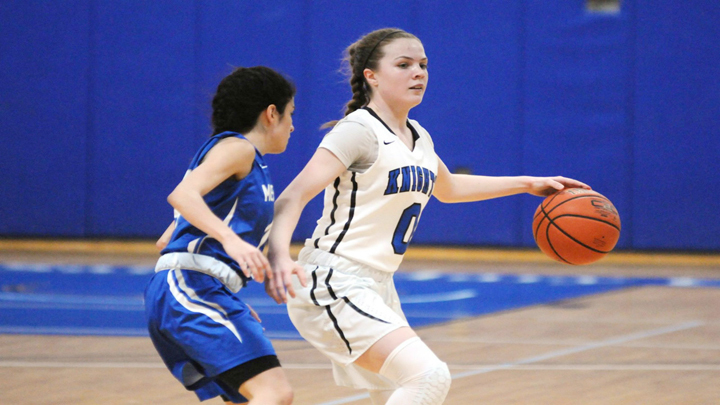 The Mount ended the contest on an 11-0 run where Morina Bojka scored six points, Julia Lavin knocked down a three and Kaitlyn Wolff buried two free throws. The Knights finished the second half shooting 40.5-percent as a team and knocked down six three-pointers. They grabbed another 10 offensive rebounds and limited the Bears to 24.0-percent from the field. Smith finished the day shooting 7-for-13 from the field, including two threes. Cleare finished with 14 points on 6-for-10 shooting and Pace added 13 points off the bench. Cleare added a team-high nine rebounds while Keenan had eight and Pace had seven. Smith also led the team in assists with four and Elizabeth Limonta chipped in eight points and four rebounds in her return to game action. The Bears were led by Quesada, who finished with 16 points and eight rebounds and Jamie Provino added 10 points. Mount Saint Mary finished the contest shooting 43.1-percent and held St. Joseph’s-Brooklyn to 23.2-percent as a team. The Knights outscored the Bears in the paint 34-16 and in points off turnovers 31-16. The Mount outrebounded the Bears 56-30, including 20 offensive, and converted 18 second chance points. The win pushes the Knights to 16-4 overall and 13-0 in Skyline Conference play.